Supply Nation CertifiedHelps towards achieving your supplier diversity purchasing goalsRepositionable adhesive.Five bold colours.100 sheets per cube. 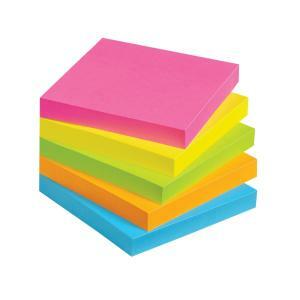 These self-stick notes are available in a pack of 5 neon coloured assorted pads of 100 sheets. With repositionable adhesive on the back, these self-stick adhesive notes help to capture messages, telephone numbers and to-do items. Dimensions: 76(h)x76(w)mm. Nallawilli Office Wares (NOW) is a Supply Nation Certified, 100% privately owned First Nation stationery and office supplies business. Nallawilli Office Wares (NOW) is exclusive to Winc and makes it easy to find and purchase products that support Indigenous businesses. This product will help you meet your supplier diversity purchasing goals. Nallawilli' is a First Nation word from the Darug Nation meaning to sit down and listen to one another'. The Nallawilli logo represents fire which is eternal, everlasting and always a symbol of warmth and ceremonies. Fire also represents thousands and thousands of years and thousands of generations of cultures, walking to and sitting down around this element, to discuss everything related to the cultural well-being, health and progress of the First Nations peoples.